Vindolanda, was a fort that once guarded part of the Northernmost frontier of the Roman Empire. Situated a kilometer South of Hadrian's wall, it was garrisoned for over three centuries starting from the late first century AD. In 1972 while digging a drainage ditch as part of an excavation of the site, a deposit of organic matter was discovered under a layer of clay. The clay had served to seal this material in anaerobic conditions which preserved a number wooden artifacts, items which under normal conditions would have decayed to nothing centuries before. Chief amongst these was over 1,000 post-card sized wooden tablets handwritten in ink and dating from the first and early second centuries AD. These tablets contain letters of soldiers, merchants, women and slaves and provide a tantalizing glimpse into the lives of a community living on the frontier of the Empire during this formative period. "... the Britons are unprotected by armour (?). There are very many cavalry. The cavalry do not use swords nor do the wretched Britons mount in order to throw javelins." "... he beat (?) me all the more ... goods ... or pour them down the drain (?). As befits an honest man (?) I implore your majesty not to allow me, an innocent man, to have been beaten with rods and, my lord, inasmuch as (?) I was unable to complain to the prefect because he was detained by ill-health I have complained in vain (?) to the beneficiarius and the rest (?) of the centurions of his (?) unit. Accordingly (?) I implore your mercifulness not to allow me, a man from overseas and an innocent one, about whose good faith you may inquire, to have been bloodied by rods as if I had committed some crime." This featured image is a 61-centimeter pan-sharpened image of the Great Pyramid in Giza, Egypt, collected by QuickBird on February 2, 2002. The Great Pyramid is estimated to have been built circa 2650 B.C., and was erected as a tomb for the Egyptian pharaoh Khufu of the Fourth Dynasty. Upon the completion of its construction, the Great Pyramid stood 145.75 meters (481 feet) high, and over the millennia has lost approximately 10 meters (30 feet) off the top. It stood as the tallest structure on Earth for more than 43 centuries. To help make sense of the surrounding structures, take a look at this map of the Giza plateau area. On the Jehoash Inscription: Hershel Shanks, editor of the Washington-based Biblical Archaeology Review, said the tablet, if authentic, would be "visual, tactile evidence that reaches across 2,800 years." On the James Ossuary: Beneath his soft-spoken, scholarly manner, a slightly awestruck tone underlies Shanks' words..."To me, the ossuary provides a visual and tactile bridge over 2,000 years". Scientists have announced that they have sequenced the SARS virus. SARS is thought to be caused by a type of virus called a coronavirus which has an irregular shape but with 'crown-like' appearance. Most human coronaviruses do not grow in cultured cells and so relatively little is known about them. Fortunately, SARS has been able to be successfully cultivated in primate cells. Scientists have worked out the genetic sequence of the virus that is thought to cause severe acute respiratory syndrome (SARS). The code supports the idea that the disease leapt from animals into humans - and should help to refine a diagnostic test. Over the weekend, two research groups separately revealed the complete genetic make-up of the suspected SARS virus, called a coronavirus. The flu-like disease has infected an estimated 3,169 people and killed 144 since November last year. The sequence suggests that the coronavirus is "far from anything known before", says Herbert Schmitz of the Bernhard Nocht Institute for Tropical Medicine in Hamburg, Germany. Although it is more than 75% identical to known animal and human viruses in some regions, it diverges widely in others. And here's that sequence that they've been talking about. Let me hum a few bars for you. A four-thousand-year-old gourd fragment found on the Peruvian coast may push back the appearance of ancient Andean religion by a thousand years. 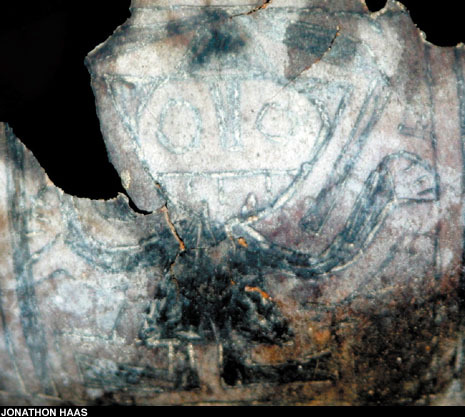 Archaeological teams from the Proyecto Arqueológico Norte Chico were conducting surface collections of looted cemeteries in Norte Chico, a region some 120 miles north of Lima, when they found the painted and incised fragment, once part of a gourd bowl. It features a fanged creature with splayed feet whose left arm appears to end in a snake's head and whose right hand holds a staff. This figure appears to be the earliest depiction of the Staff God, interpreted as the principle deity of the Formative Period Chavín culture (ca. 1000-200 B.C.). Over the course of the following millennium, the Staff God appears in various manifestations in many Andean cultures, and reappears during the Wari and Tiwanaku empires of A.D. 600 to 1000. I've been shamed (yes, shamed I tell you!) into doing something about the lousy loading time for this page through the kind words of Steve of languagehat. His appeal for some "blog maven" to help me out on the HTML was a little more than this so-called web developer could bear. Steve's own site, by the way, is sensational, a veritable bottomless pit interesting observations about language and linguistics. I wish I had read his post about click languages and genetics before I posted about it here. I've since spent quite a bit of time trawling through his archives. The site has also been just moved to MovableType and looks a treat. So anyway I'm off my arse finally and on to it. Repost Because Blogger has somehow managed to trash my archive (hey, what a novel concept! ), I thought I'd repost this piece from January. It's about about fears expressed for the fate of Iraq's antiquities in the case of a war. For Iraq's priceless heritage bombing was the least of it's troubles. At the National Museum of Antiquities, where priceless artifacts had been wrapped in foam and secured in windowless storage rooms to protect them against U.S. bombs, an army of looters perpetrated what war did not: They smashed hundreds of irreplaceable treasures, including Sumerian clay pots, Assyrian marble carvings, Babylonian statues and a massive stone tablet with intricate cuneiform writing. As employees returned today to survey the damage at one of the world's greatest repositories of artifacts, they encountered devastation that defied their worst expectations. The floor was covered with shards of broken pottery. An extensive card catalog of every item the museum owns, some of which date back 5,000 years, was destroyed. A cavernous storeroom housing thousands of unclassified pieces was ransacked so badly that an archaeologist predicted it would be impossible to repair many of the items. Deputy Director Nabhal Amin and her husband walk through the Baghdad museum. "If there were five American soldiers at the door, everything would have been fine," Amin said. The plundering that has descended upon this ancient city has invaded what amounts to the storehouse of civilization's cradle. Gone from the National Museum of Iraq is an ornate animal-covered cosmetics container from Nimrud. Gone is a finely carved tusk decorated with Assyrian and Syro-Phoenician designs. Gone is the head of an Egyptian sphinx with traces of gold leaf. All taken by the hordes of marauding thieves who in recent days swept through the museum after the fall of Saddam Hussein's regime. Gone as well, grieving museum workers said Saturday, is a delicate golden bull's head that fronts a harp dating to Sumerian rulers more than 4,000 years ago. The piece had been discovered at the Royal Cemetery at Ur, reputedly the birthplace of Abraham. "The images you are seeing on television you are seeing over, and over, and over, and it's the same picture of some person walking out of some building with a vase, and you see it 20 times, and you think, 'My goodness, were there that many vases? Is it possible that there were that many vases in the whole country?'" Well, any way, at least the Ministry of Oil building is safe.